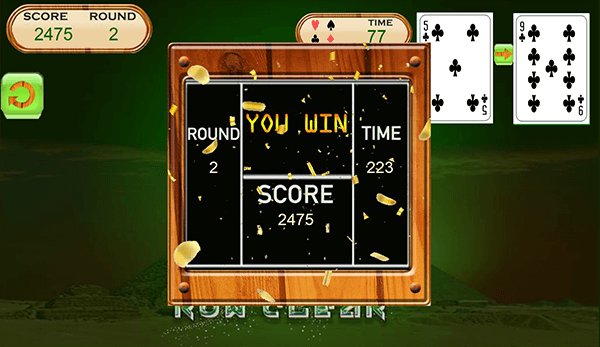 Pyramid Solitaire is played with a standard deck of 52 cards, 28 cards in the pyramid and 24 cards in draw pile. There are 7 rows of cards with 7 cards initially playable on the bottom row. The goal of the game is to clear all the cards from the card pyramid by collecting cards in pairs to make them disappear. The sum of the pairs must equal 13 points. Cards can only be removed if they are completely exposed with no overlapping cards. When all the cards are eliminated, you win the game! Cards are removed by clicking on two cards that add up to exactly 13, regardless of their suits. Face cards have the following values: Jack = 11, Queen = 12, King = 13. Kings equal to 13 and are discarded singly by clicking it, To eliminate a queen, you need to match it with an ace. For each pair you receive 5 points, King 10 points. When a row is cleared you will receive 125 bonus points. Once you remove all cards from the pyramid you win receiving bonus 10 times current score. Keep in mind that each time deck of cards are refreshed score goes to 100 points if score is less than 100. Also there is time limit of 5 minutes to clear the board and then the game is over. Use the shortest time and moves get the highest scores, become the star of your Pyramid Solitaire game. Pyramid Solitaire is full of brain training fun and captivating card game. Celebrate your Pyramid victory with our exclusive animations. Math fans, Solitaire fans and other cards games fans will fall in love with this new Pyramid Solitaire game. Use logic & strategy to become the Pyramid Solitaire champion! •	Extremely User friendly: Easy interface and smoother game play. 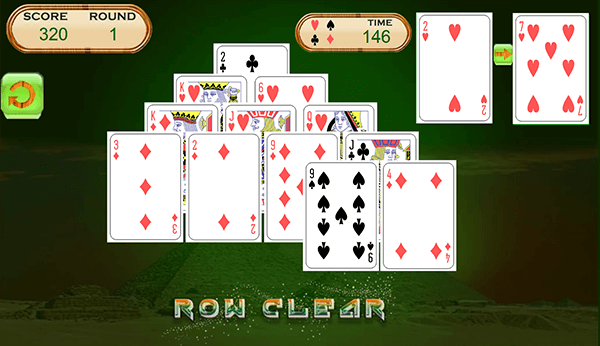 • Exciting and Challenging pyramid Solitaire game. • Nice sound effects and exciting animations. • Smooth and concise Graphics solitaire blitz. 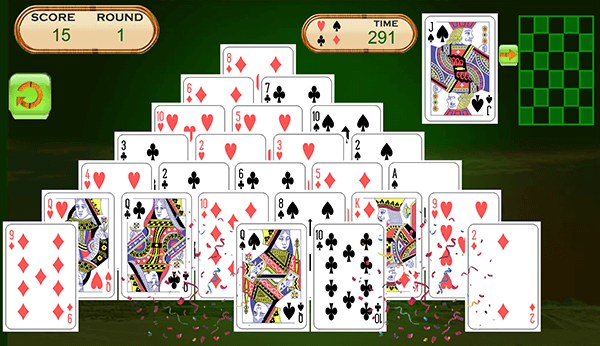 • Ad-free solitaire card game. • A true brain training experience! Name Pyramid Solitaire - Math Fun. Feature The goal of the game is to clear all the cards from the card pyramid by collecting cards in pairs to make them disappear. The sum of the pairs must equal 13 points. Cards can only be removed if they are completely exposed with no overlapping cards. When all the cards are eliminated, you win the game.